My second attempt. Not too shabby, I must say. 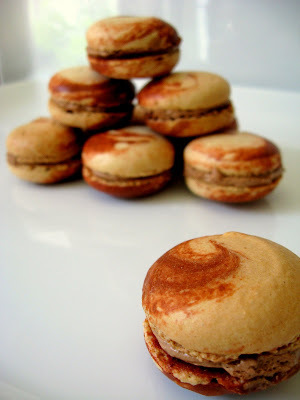 This time I used Martha Stewart's recipe for the macarons with the addition of Trablit, a coffee extract. 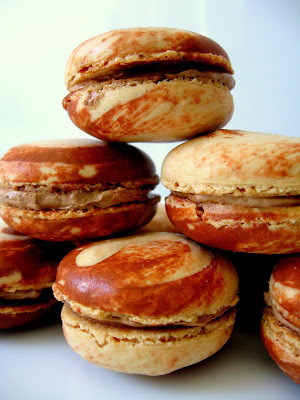 The same buttercream filling was used as with the previous macarons. To give it some extra pizazz I tried coloring some of the batter with a darker brown color and streaked it inside the pastry bag with the rest of the batter but it came out a little sloppy. But still gave it a little more flair than leaving it plain. On a tangent from my normal sweet entries, I'd like to share something brief about a rare phenomenon... cooking. I made a sandwich for myself today. 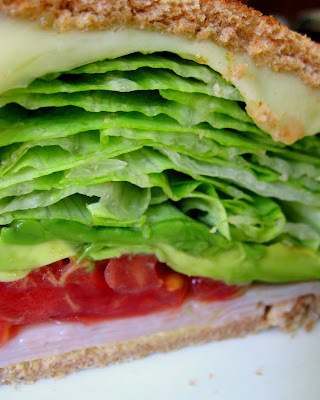 Toasted bread, melted cheese, little bit of sandwich meat, tomatoes, avacados, mustard... and a WHOLE LOTTA LETTUCE. As you can see, about 75% of the sandwich is lettuce. I particularly like iceberg lettuce because it lays more flat than romaine and has so much more of that crispy "crunch" that I so deeply love in my sandwiches. It's not because I think that this is so much healthier because I know that iceberg lettuce pretty much has next to nothing in nutrition. I just love it like that. My grandma from Korea has been staying with us for about a month now and she makes comments every now and then about how I seem more like an American person than Korean because of the things I tend to eat. She saw me eating this sandwich today and said the same thing. 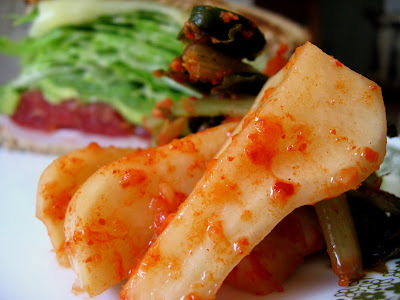 But I told her: "Grandma, as much as I am like an American person..."
"...I still need my kimchi." Nadia, these are great photos! Are you using a regular handheld point and shoot? Your food looks delicious as always. I love the creativity with it! i think the streaky one is better than the first batch. at least visually speaking. reminds me of that bad self-tanning lotion you were talking about ;D but it looks awesome as a macaroon hahaha and i myself LOVE a good sandwich. one of my absolute favorites.